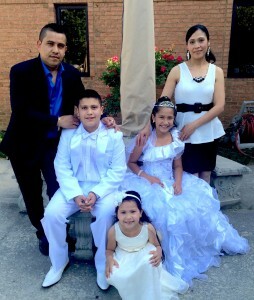 Gilberto Martinez Villa is a father of 3 U.S citizen children. He has lived in the U.S. for 16 years and made Georgia his home. Last November, immigration agents raided his family’s home looking for his brother in law, and fingerprinted everyone in the home, including Gilberto. One month later, the same agents took Gilberto to a detention center, where he has been since. The Georgia Immigration and Customs Enforcement (ICE) office has refused to release him due to a 10 year old charge. In 2005, Gilberto sold a car to someone who gave him a fake check. When he tried to cash it, he was accused of forgery. Not having enough money to afford a lawyer, Gilberto was represented by a public defender who advised Gilberto to plead guilty to avoid jail time, despite the fact that he was not guilty of forgery, without letting him know of the immigration consequences. Gilberto was put under a 4 year probation, paid his fees, and did the requested community service. Gilberto is currently at the Otero Detention center in New Mexico facing deportation. If it was not for the public defendant lack of consciousness about the immigration consequences of such a plea, Gilberto would now be with his family taking care of his wife and kids, especially his 11 year old who suffers from chronic asthma. Please help us to tell the Georgia ICE office that Gilberto should be released and back home to his family who misses and needs him. Please join the Georgia Latino Alliance for Human Rights (GLAHR) and the #Not1More Campaign in urging Gilberto’s release. I am writing regarding the detention of Mr. Gilberto Martinez Villa (A 208-414-585). He is the father of 3 U.S citizen children, he has lived in the U.S. for 16 years and made Georgia his home. Last November, immigration agents raided his family’s home looking for his brother in law, and fingerprinted everyone in the home, including Gilberto. One month later, the same agents took Mr. Martinez Villa to a detention center, where he has been since. I am aware that the Georgia Immigration and Customs Enforcement (ICE) office has refused to release him due to a 10 year old charge. In 2005, Mr. Martinez Villa sold a car to someone who gave him a fake check. When he tried to cash it, he was accused of forgery. Not having enough money to afford a lawyer, Mr. Martinez Villa was represented by a public defender who advised Mr. Martinez Villa to plead guilty to avoid jail time, despite the fact that he was not guilty of forgery, without letting him know of the immigration consequences. Mr. Martinez Villa was put under a 4 year probation, paid his fees, and did the requested community service. Mr. Martinez Villa is currently at the Otero Detention center in New Mexico facing deportation. If it was not for the public defendant lack of consciousness about the immigration consequences of such a plea, Mr. Martinez Villa would now be with his family taking care of his wife and kids, especially his 11 year old who suffers from chronic asthma. I urge you to take totality of the circumstances in the case, and consider using prosecutorial discretion in Mr. Martinez Villa’s case to release him from detention and stop his deportation.